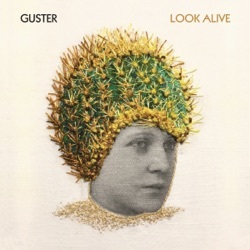 Look Alive is the eighth studio album by Guster, released by Nettwerk Music Group on January 18, 2019. ℗ 2019 Ocho Mule Records under exclusive license to Nettwerk Music Group Inc. There is a sense of mid-life reckoning, that this journey does not go on forever and it’s not a bad idea to use what time is left wisely. This is the sound of a career band still having fun. It isn’t an easy album to absorb in a single listen, but it does ensure that each encounter will be all the more engaging along the way. In evoking the '80s synth pop of their youth, Guster have unearthed a small gem that gives off a familier, yet undeniably dazzling shine. With their eighth release, Look Alive, Guster reaffirms the talents displayed throughout their oeuvre and particularly on their two standout albums, 1999’s Lost and Gone Forever and 2006’s Ganging Up on the Sun. The album never feels like the work of aging musicians struggling to stay relevant; it buzzes with inventiveness, charm, and youthful dynamism. The most musically complex and lyrically relevant work to date! This album perfectly articulates the frustration and darkness that exists in the world today, but with a reminder of hope and accountability for action. The melodies, lyrics and percussion are carefully constructed and complex. In true Guster fashion, these songs are memorable from the first listen. You will find yourself humming them to yourself for days to come. This album is innovative and fresh and every member of the band puts their unique artistic fingerprint on its creation. Great work, guys! This is one to be proud of!!! Brilliant An absolute masterpiece. Guster as you’ve never heard them before. Is that an English accent!!?? “Overexcited” is the greatest song Madness never wrote! Give it to Ryan and the guys to keep surprising us with every new album. A masterpiece As a long time Guster fan, I don’t think I can say I was ever this excited for an album release. These tracks are amazing! Lots of depth and new sounds yet there’s still some classic Guster in there. Please check out this album, you won’t be disappointed!